If you had been driving through North Texas this week you might have seen a white Dodge Sprinter van circling some of the natural gas wells and compression stations that have sprung up around the Barnett Shale belt like boom-time subdivisions. Drillers tap natural gas by splitting shale through a process called hydraulic fracturing, or fracking, that injects fluids laced with chemicals into the rock formations. The proliferation of shale gas drilling northeast of Dallas has ignited an uproar among residents, some of whom fear that fracking could be poisoning ground water and polluting the air with carcinogens. But the industry won’t disclose all the chemicals it uses and Texas environmental authorities won’t compel them to do so. Which brings us back to our mystery van. Inside was a desktop computer-sized analyzer connected to a translucent tube that snaked out the roof of the van. The analyzer is made by a Silicon Valley company called Picarro and it provides real-time measurements of methane and other greenhouse gas emissions. By correlating the data with wind patterns, Picarro scientists can pinpoint the source of emissions. Oil and gas operations emit methane, which can also indicate the presence of benzene and other carcinogens, according to Picarro scientists. 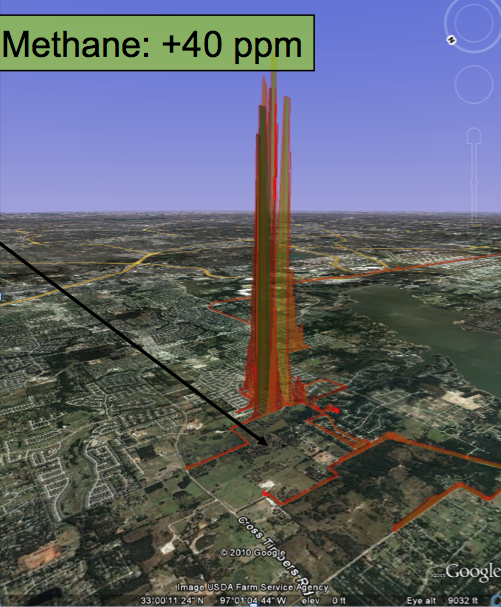 This is an image created by a mashup of the methane concentrations recorded by the Picarro analyzer in Flower Mound, Texas, overlaid on a Google map. A Picarro employee had driven the van to Texas from California at the request of Wilma Subra, a Louisiana scientist, environmental justice activist and MacArthur genius grant recipient. Picarro’s director of research and development, Chris Rella, flew to Texas and joined Subra and activists from Earthworks’ Texas Oil & Gas Accountability Project on the hunt for fugitive emissions in the towns of DISH and Flower Mound. DISH — the name is capitalized because in 2005 the town changed its name in exchange for free satellite television from the DISH Network — is home to about 200 people and a dozen compression stations that push natural gas from wells into pipelines. As the Picarro van drove around DISH, concentrations of methane spiked from background concentrations of 1.8 parts per million to 20 parts per million near the compression stations. As the analyzer recorded the spikes they were automatically plotted on a Google map. Twenty miles to the southeast in the Dallas exurb of Flower Mound, methane concentrations near natural gas wells literally went off the analyzer’s chart, topping 40 parts per million, says Subra and Picarro executives. Congratulations! You have just successfully used evidence against apples to indict apes! While I do not doubt the results of this group’s research, I assure you that is has absolutely no bearing on the safety of frac’ing a well. (Note that in the industry, “frac’ing” does not have a “k”, as the word “fracturing” does not have a “k” either.) The concern for well frac’ing is that the process could damage groundwater sources. This is true, although a prudent driller and completions company have virtually no chance of this happening. Note the word “prudent.” I have seen lots of scary things in the industry, and I am not saying that it cannot happen. Also, with regards to benzene, your technicians should know that gas and benzene are completely different compounds, and while they can occur in the same places, the evidence of one in no way indicates the other. Plus, methane is normally found as a gas in air. Benzene is much more frequently found (and much more dangerous) dissolved in liquids such as water. Reducing the pressure of the water then causes the benzene to “flash” to atmosphere, but it is still heavier than air, so it tends to stay in low lying areas, making a van less likely to notice it while driving around. Overall, this article is so rife with errors that I am (1) ashamed for Fortune to be running it on their servers and (2) tempted to drop Green Wombat from my reading list. In the future, please try to do a little more research and keep your articles on-point, not shooting at anything in the overall vicinity of data. I have to agree with the previous poster. The author indicates 40 parts per million methane in air is some sort of unfathomable concentration of gas. You show many any relief valve on any gas-pipeline in america that is venting and I’ll show you 900,000 parts per million of methane in air. Junk science being used to scare up the public. Nothing more.